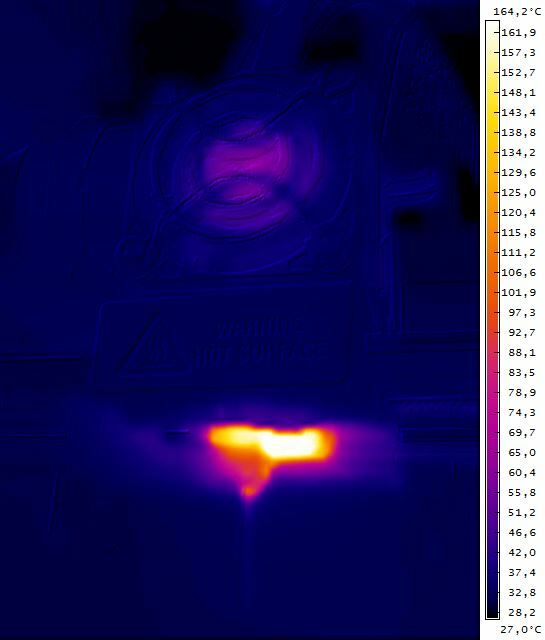 If you have wondered how the extruder of a 3D printer looks like in terms of operating temperature this thermal image can give you some idea about that. It is of the extruder of MakerBot Replicator 2 3D printer, but the situation is similar with other devices that are based on the same technology using thermoplastic material. Pretty much the heating block is the hottest thing and the rest of the extruder remains with a relatively low temperature, but if you have trouble with the extruder working properly one of the things that may be causing this is other components getting hotter than they should be. One of the most annoying issues with 3D printers that extrude thermoplastic materials is when the filament jams inside the extruder causing a failed print and if the problem persists you need to figure out what is causing it. The problem is that there could be numerous thing that are causing the filament to jam and stop extruding from the nozzle and you need to check them one by one until you resolve the issue and are able to continue printing again. One of the most common causes, the one you should start with, is to check the build plate and try to level it again as often after a few prints the position of the build plate may change a bit along the Z axis and this may cause trouble for the filament to either stick properly or to come out normally from the nozzle. If it the filament happens again after a bit of normal operation after you have realigned the build plate and you are sure that it is not the cause, then you might want to check the thermal insulation of the heated block of the extruder. Usually, as is the case with MakerBot Replicator 2, the heated block to which the nozzle is attached is insulated with special kind of insulation material that is taped with Kapton tape. If the insulation needs to be replaced as it is not functioning properly anymore you may need to replace it or it can cause the filament material to jam inside the nozzle. If you are having trouble with the insulation the actual temperature of the block that melts the filament may be lower than it is needed for normal operation with the specific type of filament used and this may lead to the filament jamming as it is not hot enough to come out at the desired speed from the nozzle. An easy thig you can usually do to check if this is the cause for the filament jam is to increase the extrusion temperature with 10-15 degrees Celsius over the normal one you use and if the jams do not happen anymore then it could be the insulation. Based on our experience we have found out that anther cause for filament jams could be the nozzle that the extruded thermoplastic material goes through, even though it might seem just fine it can still be the cause. So you should always have a few nozzles as spare to replace them over time as they do wear out and the process is faster if you use composite filaments such as ones that contain chopped carbon fiber or other materials as a part of the filament. 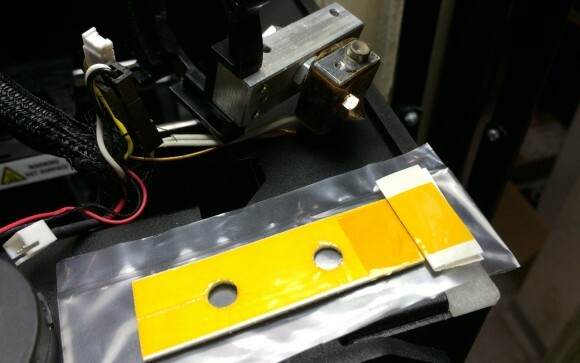 Another different kind of issue that can appear over time that can cause jams or problems with proper extrusion of thermoplastic is the feeding mechanism of the extruder of the printer. If the extruder uses a spring to provide tension to the filament feeding mechanism after a while the spring may soften up and the tension may get inconsistent or too little for proper feeding of the thermoplastic material into the nozzle and as a result cause a jam. Sometimes the 3D printer jams can be caused by various other things such as low quality filament, the use of exotic material that is not designed to be used with your specific 3D printer and so on, so it is not always easy to figure out what is causing the issues and you need to start checking and eliminating them one by one until you find the culprit. The 3D printer we are using, namely the MakerBot Replicator 2 is equipped with a 0.4 mm nozzle for extruding the molten thermoplastic and this does provide a decent speed/quality options. However various 3D printers do use different nozzles that have varying hole diameter, so we wanted to play a bit with that and to try replacing the 0.4 mm default one with different size. Our first try was with a nozzle that had double the size of the hole for extruding the thermoplastic material as compared to the standard one, so 0.8 mm instead of the 0.4 mm one. 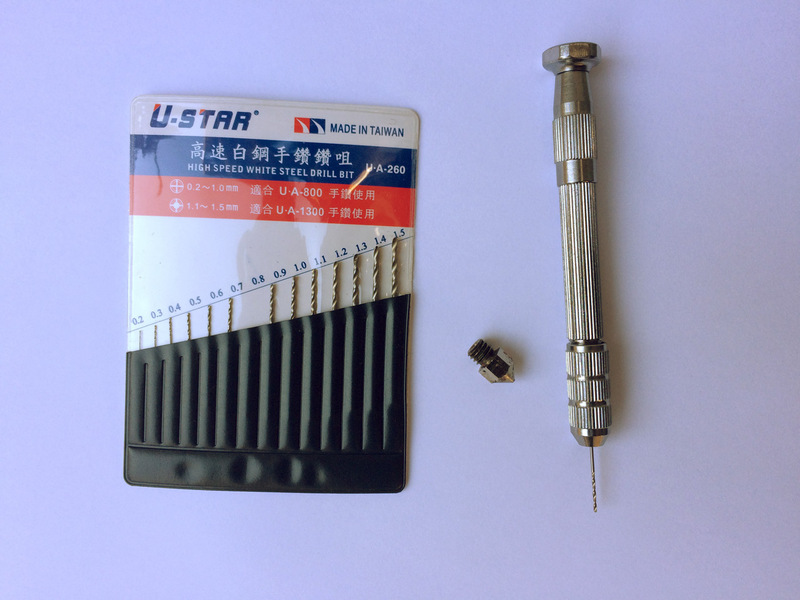 We have created the nozzle ourselves by carefully enlarging the hole of a standard 0.4 mm nozzle with a precise 0.8 mm drill bit, an operation done slowly and by hand and not with a rotary tool. The idea to use a nozzle with a larger hole was to try printing with rougher detail level at a faster speed, but also to see if it is possible to print finer details with good enough quality as with the smaller nozzle. To test we have used a small simple house 3D model that looks like an easy to print thing, but is actually a more complex and demanding than you may think while still fast to print even at small layer sizes. 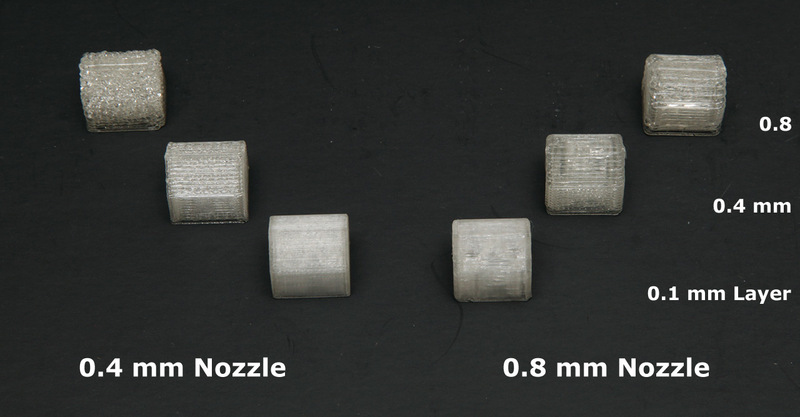 We have test printed the simple house with both the 0.4 mm standard and the larger 0.8 mm nozzles with three different layer heights – a very fine one at 0.1 mm, rougher details at 0.4 mm and very rough details at 0.8 mm layer height. There are some rules for the settings when you are printing in the form of ratios such as the one between the layer height and the extrusion width depending on the nozzle diameter you use in order to get the best possible results. In general however printing with a layer height over the diameter of the nozzle you use is not recommended as it does not produce so good results. Printing with the standard 0.4 mm diameter nozzle took about 22 minutes at 0.1 mm layer height, 7 minutes at 0.4 mm layer height and 4 minutes at 0.8 mm layer height. The resulting quality at 0.1 mm was great, at 0.4 mm was pretty good and at 0.8 mm was awful and pretty much unusable at standard printing speeds. We have tried lowering the extrusion speed at 0.4 mm and 0.8 mm to allow for easier printing and hoping for a bit better quality, but that did not help. Replacing the nozzle to the modified 0.8 mm one took us about 16 minutes for printing at 0.1 mm layer height, 5 minutes for the 0.4 mm layer height and just 2 minutes at 0.8 mm layer height at the standard speed settings. The fact that we have larger hole on the nozzle allows us to extrude more material for the same amount of time than with a smaller nozzle diameter and as a result we could increase the speed. But even without increasing the printing speed we got faster print times with the default extrusion speed of the Replicator 2. The quality of the 0.4 mm print was comparable to that of the print with the smaller nozzle and that of the 0.8 mm was as expected better even though at that layer height the number of fewer layers used made the object seem rougher. At the setting using thicker layers we could further increase the printing speed at up to about 50% over the standard one for the 3D printer and get the same quality results. With the highest quality 0.1 mm layer resolution however we’ve had to lower the speed a bit in order to get good results, at up to about 25% lower extrusion speed the print result was actually surprisingly good. Do note however that while the layer resolution with the larger 0.8 mm nozzle could go in a wider range as compared to the standard 0.4 mm nozzle there are some drawbacks. As you will probably see on the photo above the corners of the house that are supposed to be 90 degree ones are a bit rounder on the prints done with the larger nozzle. Also there are some tweaks to the print settings that you need to consider when printing with a larger nozzle, you can for example reduce the number of outline/perimeter shells, especially when you get to use smaller layer height as the layer width will actually be twice the one of the 0.4 mm nozzle. So instead of two outline shells you can go with just a single one and that is especially important when you are printing smaller objects where the use of two perimeter shells might actually cause you trouble printing properly. In the end if you need to print larger models where the level of detail is not so important, but the speed of the printing process is more important you might want to play with nozzles that have larger diameter than the standard ones used for your printer. Next up we are going to be trying out with twice the smaller diameter nozzle, namely 0.2 mm as this is pretty much the smallest one you can currently find available.